If your an avid bird hunter or even a beginner with a new dog, walking behind a dog that has been trained properly on how to hunt is so rewarding. Do you get excited when the dog goes on point and you can walk in to the flush? Do you feel a sense of pride when you go through a field or section of woods someone just left, and you still found birds? Would you like a dog that you can hunt with and not for? We can give you that dog of a lifetime! Option #1- Board and Train. If you are a busy individual or family, this is a great option. We would get together, discuss your goals with the dog, and leave your canine here for training. You would be welcome to come an work your dog as you are available, and upon pick up, we spend enough time together for you to be comfortable that the dog will do the job you wanted it to do for you in the field. Option #2 - If you are living close enough, or can drive for a weekly private, we can work the dog for a couple of hours, and you will have homework to do with you and your dog when you are home. Most things you will be able to do at home, and come back weekly to review and add on to your training. I do have birds here to work with, so we could work for a couple of hours. Option #3 - Occasionally we do training days here at the farm/ or local preserve. You can bring the family, camp in the area, and work the dog for the day at the farm. Price includes birds, lessons, cold beverages (soda, water) water tubs for the dogs to cool off in. Limit of 10 dogs for the day. 3.5 months old, Zuzu on her first bird. Whoa intro - getting familiar with the command "whoa"
More birds! 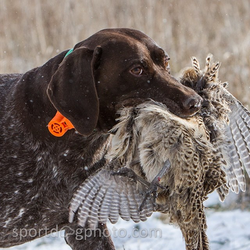 Birds make the bird dog! 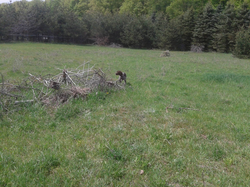 Field obedience with more control and commands. Using the e-collar with more commands. 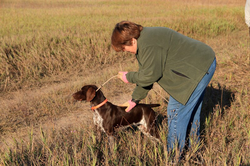 Utilize field commands to teach the dog to hunt objectives. 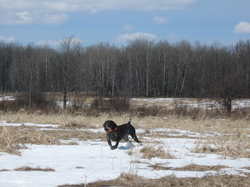 After the training, we will spend time in the field and grouse woods together, making sure that you can master your dogs new found knowledge.